Do you love the idea of having delicious ice cream served to you and your guests, or how about making your own ice cream sundaes? We offer two different ice cream hire packages, the Simple Package is unlimited ice cream served to you and your guests in a cup or a waffle cone for up to two hours. 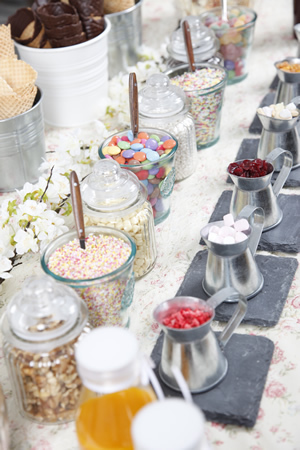 The Sundae Delight package is the same as the Simple Package but we also provide a sundae table with lots of toppings, sauces and sweets, so you and your guests can make your own ice cream sundaes, this is also unlimited for two hours. Plum Honeychurch ice cream and sorbets taste as good as they look. All our ice cream and sorbets are made by The Ice Cream Union, artisan ice cream makers from Italy and Argentina arguably the two finest ice cream making countries in the big wide world. Here are just some of the ice cream flavours we supply, but new ones are always being added depending on the seasons. Plum Honeychurch and Her Ice Cream Tricycle are based in Ascot, Berkshire but we are happy to travel to London and the Home Counties (including Surrey and Hampshire), and, if you ask us nicely enough, even further than that. 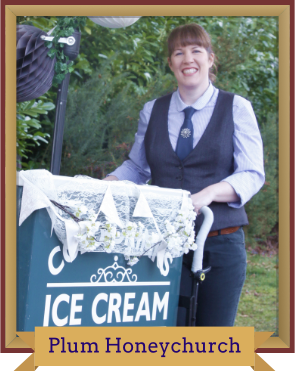 Our service is about bringing you the best ice cream in a vintage style, but we want you to have a bespoke experience and we will be happy to work with you to make your event as individual as you are. 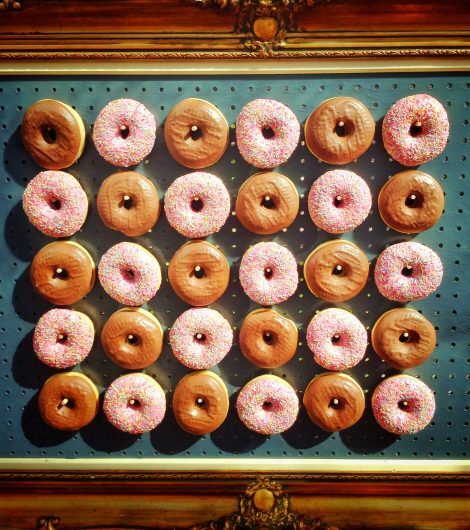 A Donut Wall is a great addition to a grand event, wedding, a treat for a staff meeting or a talking point for a business promotion. Add the Donut Wall to the “Simple” or “Sundae” packages or have the Donut Wall on its own. Freshly baked doughnuts from our local bakery in four flavours, Iced, Strawberry, Chocolate Sprinkles and Caramel. Any donuts left after the two hour booking will be placed in bags for your guests to take home. £150 for 55 doughnuts plus £2 for every extra donut after that.